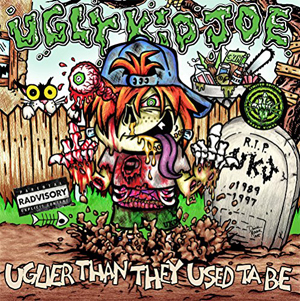 UGLY KID JOE have released a new video from their 2015 album Uglier Than They Used Ta Be. The video for the track “Under The Bottom” features MOTORHEAD guitarist Phil Campbell and you can watch it now on KNAC.COM right HERE. Uglier Than They Used Ta Be was recorded at JT Studios and Balance Studios in Louisiana under the helm of producer and UKJ guitarist Dave Fortman (SLIPKNOT, GODSMACK, EVANESCENCE). Whitfield Crane (Vocals) and Klaus Eichstadt (Guitars) teamed up with Sonny Mayo (Guitars), Shannon Larkin (Drums), Zac Morris (Drums), Cordell Crockett (Bass) and Dave Fortman (Guitars) to form the now 7-member line up a.k.a. “Seven Headed Monster” and write and record in the studio. The result is the most cohesive sounding UGLY KID JOE record to date. MOTORHEAD guitarist Phil Campbell also appears on the track “My Old Man”.